Any work that affects an existing chimney (including installation of a stove or flue liner) or creates a new chimney is considered building work and so comes under the Building Regulations. The Government issue an Approved Document which contains practical guidance on ways of complying with the Requirements of the Building Regulations - click here to read the Approved Document J which deals with Combustion Appliances. The document is relatively long and detailed so below we have answered the most common questions relating to these requirements. 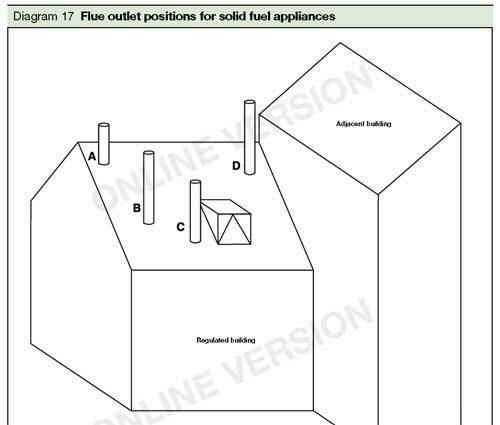 Can I fit a flue liner / chimney system / stove myself? Yes. Most of our customers fit their stove and or flue liner / system themselves. You do not have to use a professional installer if you are competent to do the work yourself. If installing the stove into an existing fireplace/chimney and not using a new chimney liner then the installation is very straightforward for a person with average DIY skills. Installing a flexible chimney liner or complete twinwall system is a larger job and may involve ladders or scaffolding if external access to your roof is needed, but is still technically straightforward. Our twinwall chimney system simply slots together, no specialist knowledge or skills are required. If you complete the work yourself then the local council Building Control should be informed and they can then inspect the work on completion to sign it off. Alternatively if the work is done by an installer who is accredited by one of the relevent Competent Persons schemes such as HETAS then they can sign off their work and provide you with a certificate. No, not normally. Installation of a stove and/or new flue system would not usually have anything to do with the local planning authority. If your propety is a Listed Building then permission may or may not be required. If you intend your new flue pipework to run up the outside of an external wall then depending on the position (e.g. side or front of house) you may need to check with the local Planning Department. Do I need to line my existing chimney? Most houses built after 1964 should have a concrete/clay inner liner in which case you probably dont need to reline unless there is a problem with your existing system. Older houses will normally just be exposed brick inside - it is not a legal requirement to line these older chimneys unless they are leaking, but there are often advantages to lining such as increased draw, piece of mind of having a sealed system top to bottom, reduced risk of chimney fire or leakage etc. The existing chimney/flue should be swept clean before any stove installation and checked for condition and correct operation. e.g. a smoke pellet should be burned at the bottom to check for any leaks or blockages in the system. Your local chimney sweep should be able to clean the chimney and advise on it's condition if you are not sure. We always advise that chimneys in older properties should be lined. Our flexible chimney liner kits are great value for money and will ensure best performance for your stove. If you are unsure please give us a call and we can discuss this with you. Many of our stoves have been tested to show they do not cause the upper surface of the hearth to raise above 100°C. These stoves can therefore be placed on a non-combustible hearth of a minimum thickness of 12mm. The material could be e.g. slate, stone, marble, granite, concrete, glass, ceramic tiles etc. Other stoves (usually larger models) should sit on a constructional hearth made of solid non-combustible material such as concrete, at least 125mm thick. 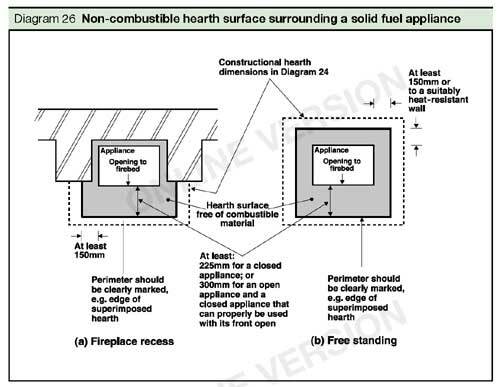 Combustible materials should not be placed beneath constuctional hearths unless there is an airspace of at least 50mm or the combustible material is at least 250mm below the top of the hearth. For free-standing appliances (i.e. 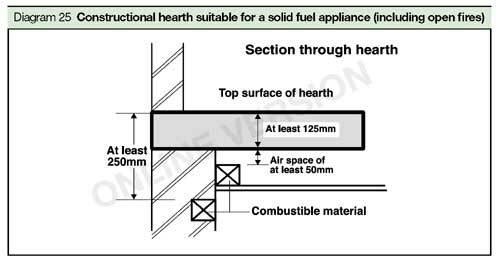 not fitted into en existing fireplace/chimney) the hearth should be a minimum of 840x840mm. There must be a minimum of 150mm from the sides of the appliance to the side and rear edges of the hearth and 225mm (for stoves designed to be used with the door closed) from the front of the appliance to the front of the hearth. Note: for large stoves that will mean the overall size of the hearth may be greater than 840x840mm. Most solid fuel appliances in the UK have either a 5" (125mm) or 6" (150mm) flue outlet on the top or rear of the appliance. You will normally then use the corresponding sized vitreous enamel flue pipe for the first section of flue from the stove to take you into the chimney. From that point you will then usually have to change to a minimum 6" (150mm) flexible chimney liner or rigid insulated flue system. If you order a flexible liner kit or full twinwall flue sysytem from us it will come with the suitable adaptor to connect to the 5" or 6" enamel pipe. That applies to most solid fuel appliances. The exception is for DEFRA Approved stoves which have a 5" flue outlet. They can legally be used with a 5" chimney liner or full flue system as they produce less smoke particles than other stoves. How high does the flue have to go? 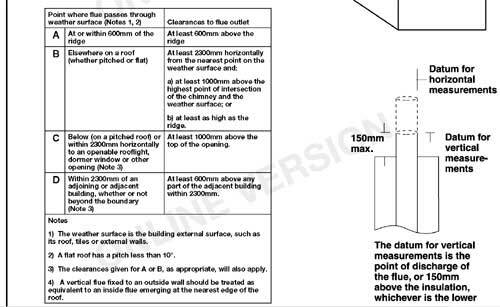 When installing a new twinwall flue system, if the flue exits the roof within 600mm (horizontally) from the ridge (high point) of the roof then the flue must extend a minimum of 600mm above the ridge. 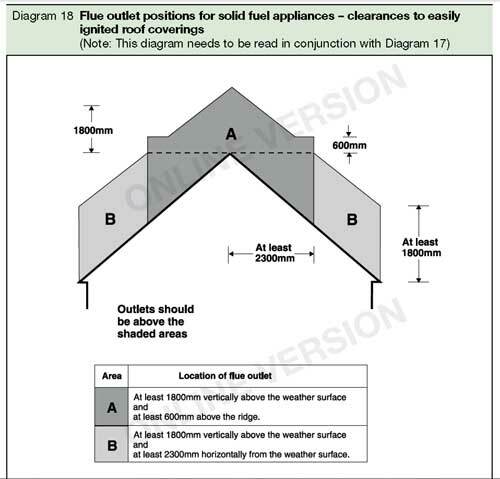 If the flue exits the roof further down then it must extend high enough to acheive 2.3m of horizontal clearance. That height will be determined by the pitch (angle) of your roof. We can work out the height required when we design your system. If unsure please give us a call. Do I need extra room ventilation? Normally for most houses in the UK no extra ventilation is required when installing a stove rated at 5kW or less. For stoves above 5 kW a permanent air vent connected to the outside is required in the same room as the appliance. The size of the vent would normally need to be a minimum of 550mm² per kW above 5 kW. e.g. a stove rated at 7kW would need 550mm² x 2 = 1100mm². That would be a square opening approx 33mm x 33mm. The purpose of prividing extra ventilation for larger stoves is simply to ensure there is enough oxygen being supplied into the room to allow proper combustion in the stove. Note: The requirements regarding ventilation have been updated in the most recent version of the Regulations and are now based on the air permeability of the house. Houses built after 2008 should have an air permeability test result which you should be able to see at the time of purchase. In practical terms what is likely is that the newest houses will be very air tight, i.e. no gaps under doors etc., and so will have a greater requirement for extra ventillation. If the test result shows an air permeability of less than 5m³/h.m² then in these cases the requirement is 550mm² per kW, regardless of the total kW output of the stove. If in doubt please ask us for advice and we'll do our best to help. It is unlikely that a property built before 2008 will have an air permeability less than that so the normal procedure will apply to 99% of properties i.e. only stoves greater than 5kW need a vent. If you do require a vent, don't worry, they are easy to fit yourself and are not expensive at all - see here. Buy our quality carbon monoxide alarm here. Where a new or replacement fixed solid fuel appliance is instaleld in a dwelling, a Carbon Monoxide alarm should be provided in the room where the appliance is located. b. between 1m and 3m horizontally from the appliance.